There’s nothing so bonding as reaching your goals as a couple. Setting goals together, planning dreams, and creating bucket lists: these are all incredible and meaningful. So we’re bringing you 101 bucket list ideas for couples, designed to help you dream big and find adventure! Sharing and pursuing your dreams, going on wild and crazy journeys, and creating an endless treasure chest of experiences…hopefully laughing and smiling all the while! This is the ultimate bucket list for couples, one that includes not just romantic, sweet relationship to-do’s, but incorporates a hefty dose of adventure & travel. After all, we believe that all couples should travel together (at least once!) as it’s been one of our favorite life experiences, and it is definitely a relationship-builder. There are lots of cool bucket list ideas below for you to choose from. We’ve researched and chosen 101 items that we think would create a beautiful, romantic, and well-rounded experience. This could be a married couples bucket list, an engaged couples bucket list, or a list for duos at any stage of their relationships. And though the majority of these are meant to be shared, there are certainly many things you can do solo, too. As a couples travel bucket list, we included some of the world’s most famous sites, plus specific places we’ve been that we think were truly amazing. We tried to include a travel experience on every continent. Of course, these are all just suggestions, and we encourage you to adapt the list and add your own wishes and aspirations. The sky’s the limit! Warning: life-changing couple activities ahead! Camp somewhere with spectacular views of the night sky and revel in the mystery of nature. Dolphins, manta rays, whale sharks, take your pick. Swimming or snorkeling with wildlife is an unbelievable experience. Go back in time and feel like royalty with a stay in a castle. There are a bunch of these castle hotels, especially all over Europe. Go where your heart leads, and try to make time for those lesser known spots. The reward will be worth it! Add this to your couples to do list ASAP. There are so many incredible places to go hot air ballooning, including Cappadocia, Turkey. One of the world’s ancient and fascinating wonders. It’s like a rite of passage, isn’t it? And who knows…maybe you’ll get lucky! You MUST have the experience of a totally luxe hotel stay. Maybe this will be your honeymoon, but don’t wait: find an epic hotel and book it. If you’re ready for the responsibility and commitment, providing care and love is an endlessly rewarding experience. If not…get some house plants. It’s a cliche MUST DO together. Some ideas? Aruba. Western Australia. Bermuda. Fiji. Seychelles. Zanzibar. You might need to save your pennies for this, but a ride in your own private jet could be a once-in-a-lifetime must-do. Head deep underwater to discover a brand new world below the surface. You can also see brilliant colors and abundant wildlife in the shallower parts of the sea. Snorkeling is so much fun. There’s nothing quite as cool as eating authentic local cuisine in its country of origin. If not in Japan, do this somewhere. …even if you’re not that interested. Your partner will love you for it! Smash those goals side by side. Then enjoy celebratory beers/cocktails afterward. Nothing says romantic couple activities like smooching in the most romantic city on Earth. The classic City of Love beckons all lovers to visit. Another iconic place to take the love of your life: Venice, Italy. Hop onto a gondola for a delightful ride through its canals. If you’re extra romantic, you’ll sing while you row. An essential addition to your relationship bucket list. Especially before you’re married, “playing house” while house-sitting for friends is so adorable! Animal lovers should definitely jump on this, as taking care of pets is a fun and bonding experience. Pick your brand of scary! Skydiving isn’t for everyone… The key is to choose something that excites you both (and freaks you out slightly) and just go for it! How about volcano boarding in Nicaragua? Or Angel’s Pool in Zambia? These are great options for unique and fun things for couples to do. Not only is this beneficial for your travels, it will expand your minds. Oh, the laughter! If possible, see one of your favorite comedians. That’s where I went to high school! That’s the house I grew up in! Share your memories with your S.O. Fireworks, champagne ‘a-flowin, revelry. Ring in the New Year in a huge crowd and don’t forget to kiss at midnight. One of our favorite things to do as a couple is see wildlife. 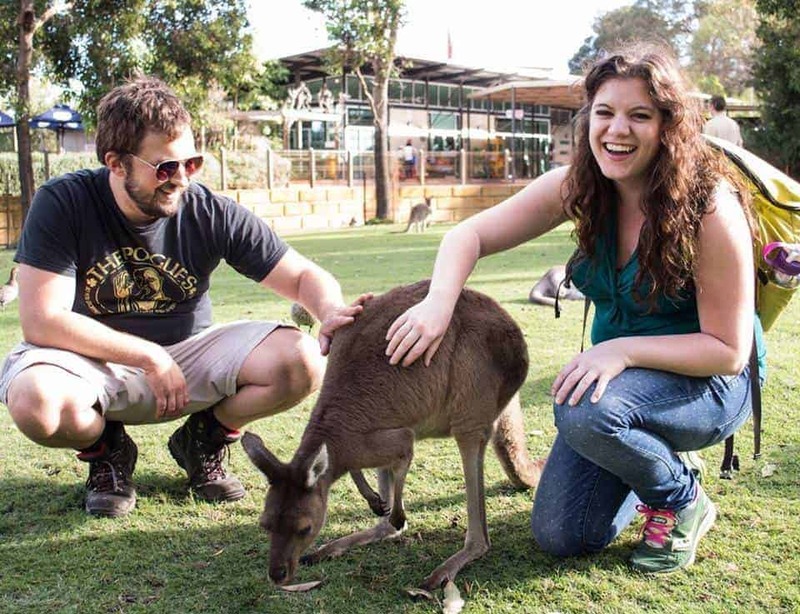 Petting kangaroos was definitely one of the best things we ever did. Do this while you’re in your 20s or 30s….oh hell, do it whenever you please! Ibiza is the epicenter of European party life. One of the most captivating journeys, surely. B&B’s are a totally different experience—and one worth having. Relax and enjoy one another’s company. Work together & with your group to battle your way down the rapids. What you do is completely up to you, but do this thing without expecting anything in return. Music brings people together. Attend a multi-day festival for the full experience. Head to Florence, Italy, or another of the world’s best art destinations to take in the masterpieces. If possible, bathe in it. Probably not recommended for the powerful waterfall pictured! Oh, what is better than a couples road trip? It’s one of the coolest ways to experience a country or region and it brings with it its own relationship-boosting challenges. If you really want to boost your relationship through some challenges, campervan together around Australia or New Zealand. These are gorgeous destinations, but you’ll really give your relationship a test on such a trip! Just do it. It’s a requirement. We really want to cross this off our romantic to do list! The most romantic sunsets on earth just might be found in this Greek city. Fancy yourselves intrepid explorers and travel to one of the world’s oldest cities or civilizations. The Empire State Building, hot dogs, Times Square, the Statue of Liberty: do it ALL. Seriously cold, but also seriously cool. PS: You can hold each other for warmth! So many amazing creatures and lush vegetation. In Ecuador, you can swing at the end of the world. Beautiful views and a bit of a thrill. A great challenge for the mind and body, plus tons of fun. If you have a bucket list for travel, perhaps snuggling one of these precious animals is on it. Find a responsible wildlife provider and let your dreams come true. Do you trust your partner? Put their driving skills to the test in a place that drives on the opposite side of the road. Barcelona is a gorgeous and delicious city that all couples should explore. Whether you’re 15 or 50, this is a classic couples bucket list item. At some point in your relationship, climb a mountain together before dawn so you can share a spectacular sunrise. True pleasure is an epic body massage for two! Cruises can offer some fantastic destinations. It’s a different way to travel than you might be used to, but it’s one every couple should experience together. Climb onboard! A massive festival of beer, food, and fun, Oktoberfest is a travelers’ bucket list item you won’t want to miss. Do it together, wearing a dirndl and lederhosen of course. A little friendly competition never hurt anyone. Who’s the better bowler of you two? On any bucket list for couples: Safari! A dream trip, for sure. A safari in Africa is sure to be endlessly thrilling with plenty of romance as well. As part of your relationship bucket list, take turns cooking for each other. Even if you’re not much of a cook and your meal turns out terrible, you’ll make a hilarious memory in the process. One of the most phenomenal experiences for us in 2017 was the total solar eclipse that crossed the USA in August. We were honestly utterly in awe at this miracle of nature. You should absolutely plan to witness an eclipse with your sweetheart if possible. Here’s a list of all the upcoming eclipses. Don’t leave your covers. PJs optional. An epic site that all people should try to travel to at some point. Ah romantic Rome! Toss a coin over your shoulder into Rome’s most iconic fountain and legend says you will someday return. A pretty breathless experience, to be sure. Pick an insanely beautiful beach. Ride an insanely beautiful horse. Be hoity-toity and talk about the merits of each piece of art. Bonus points if you don’t know the first thing about art. Push your boundaries and touch an impressive peak. Everest would be good, but any mountain will do! As a child you no doubt wanted to live in a tree house. Now you can….at least for a few days! Check off this in your couple bucket list book. This is definitely one of the Two Drifters’ personal couples bucket list items. Cute llamas, towering green mountains, insane gorgeousness…what more do you need? In the winter time, one of the most romantic activities for couples is ice skating, especially if its on a natural pond or lake! Most of these bucket list ideas for couples have you getting out and about, but for this one, it’s all about staying in for the day/night and bingeing an entire series (or at least a season). Do something meaningful for your community together. Bucket list travel ideas: visit Disneyland or Disney World! It’s the happiest place on Earth, and you two will make it even happier! Hot towels, free drinks. Everyone should travel this way at least once. It’s sweet and intimate, and it makes ordering at Starbucks so much easier. A fabulous road trip is a must for your couples bucket list. One exceptional road trip is Australia’s Great Ocean Road. Witness the stunning coastal formations along this amazing route. Crafting a delicious meal together is a terrific way to laugh, learn, and eat…plus it will give you meal prep skills for the future. Reel in a big one! This is perfect for romantic things to do with your boyfriend, husband, or literally anyone who gets a thrill from catching huge fish! If you can make it happen, nothing would be more memorable than this! Teamwork makes the dream work….and maybe wins you some $$! One of the most memorable things couples can do together is to see a lame tourist icon, and laugh about it together. Don’t forget to take a couples selfie! Adventurous experiences are always good bucket list ideas. Nathan has already done this…and I am very jealous. Sip all the varietals and pick out your favorite to take home. Looking for romantic things to do with your girlfriend? Take her dancing! Dancing is great exercise, of course, but is also undeniably romantic. Stay out all night as you sway to the rhythm of the music. Getting out in nature and picking fruit is great in all seasons. After picking apples (or berries) head home and spend some time in the kitchen. Pick a book and take turns reading it loud to one another. Or, check out multiple copies from the library and then discuss a chapter each day. On a rainy day, stay inside and bring back your childhood by building a blanket and pillow fort in your living room. Need some inspiring travel ideas for couples? Go backpacking together! Backpacking is a classic travel bucket list item, and SE Asia is an outstanding place to do it. It’s budget friendly, warm, full of good food, beautiful beaches, and rich culture. You could also consider backpacking through Europe or another part of the world. Grab your honey and go and cheer on your favorite pro sports team. Luxury living for a week! Charter a private yacht somewhere glorious. Dinner is all about the company…and the view. There are some amazing restaurants out there, and some luxury hotels with fab views. Room service, anyone? Go ahead, be sappy. There’s something seriously sweet and genuine about writing poetry for one another. Let it snow! Let it snow! Rent a cabin in the mountains and pray for a blizzard! A county fair is so laid back and full of sights, sounds, and smells! Ride the rides and eat a gigantic funnel cake. One of the world’s most famous events, Carnival, is a great bucket list choice for couples. More team fun! Invite over a few couple friends and play your favorite board games. Have you seen those gorgeous overwater bungalows in tropical places? What a dream! Being only steps away from the tea is utter paradise. When the snow has freshly fallen, grab a sled and fly in tandem down a hill. Even the most special bucket lists for couples may not include this item, but it’s an exciting must for you and the one you love. Always be safe and be courteous! A private outdoor space is definitely recommended! Scotland is intrinsically romantic. In fact, it’s where we Two Drifters first met! Travel the mystical highlands together, indulge in whisky, and fall deeper in love. This relationship rite of passage is a big one. Iceland is a hot destination, and the Blue Lagoon is one of the most romantic spots of all. Go soak with your partner and reap the benefits of the healing, soothing hot springs. At one time or another in your relationship, one of you will get sick. Taking care of your significant other is an act of love that will bring you closer than ever before. An iconic destination: perfect for your adventure bucket list! Together, you must stand in awe of one of the most spectacular places on earth. No matter what adventures you take with your partner, be sure to pursue the most amazing adventure of all: love. Want to save this couples bucket list for later? Amazing list and needs lifetime to be done all of it, but that’s the point isn’t t? 🙂 I’d love to try most of them, but I believe the most romantic one for me and my partner would be to have children and have dinner on a balcony with a stunning view… Great article, useful and meaningful. Thank you! Excellent post. Keep it up. Looking forward to more great info.